Why Annie Armen: Stealing Business From Your Competition -- Ethical or Unethical? Stealing Business From Your Competition -- Ethical or Unethical? Ethical vs. Unethical … What is Right and Wrong When it Comes to Stealing Business? Simply put, nobody is a good enough salesperson to come in and take a client of yours if they are loyal to you and your company. Period. If they are able to take your business then you did not deserve it. Same with your good employees who leave you for your competition. So What is Ethical? It is easier to define unethical so let’s do that one … not doing all you can within the limits of the law to provide for your employees. End of story! So now, think for a moment or two, how many times did you not pull out all the stops to acquire and account from the competition. In doing so, how many people did you let down? ... story from my book titled Ethical Theft ... "A Salute to Industry". I would approach our top six clients and tell them that we have been thanking them for far too long now and it was high time we helped them improve their profits as well. I would explain that we wanted to dedicate a space in our hotel for them to advertise their products and services. We would calculate how many guests would walk past their exhibit over the course of a month and the number would be quite impressive....it even surprised us when we first calculated it. So for 30 days there would stand an attractive display behind velvet ropes, a sign telling our guests who this client is and how they can contact them if they wanted to hear from them. At the end of the month when it was time to take their display down for the next client, we would have a cocktail and hors d' oeuvres party around their display. We would take an 8X10 photo of the event and mount it in an attractive frame and mount it on the wall where the display would be for posterity. We would also send a similar photo to that company for their use (public relations, company newsletter, annual financial statements). We were in essence thanking them for their business by helping to provide them with business as well. Now, for the remaining six months of the year we would ask POTENTIAL clients to advertise their "wares" in this Salute to Industry area. We would have a reception around their display at the end of thirty days and they would see a wall with pictures of our happy existing clients. We would now be on a fast track to liberating more business. What was normally dead space in our hotel became a real profit and social center of attraction. I would sometimes be passing by that area and see an unknown guest looking at it and picking up a brochure to learn more about that company. I would approach them and tell them who I was and tell them the cool things about our clients or hopeful client's product or service. A real person having a real conversation with a real person who had real interest. How cool is that? Ethical Theft -- The Book! 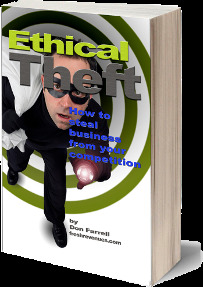 If you are looking to laugh, think and wonder how far you or your competition would be willing to go to acquire business, Ethical Theft is the book for you! One recent review states: "Don Farrell has a take on business ethics that may shock some, but in light of current economic times, it is a pragmatic and sensible approach. If you want to do your best for yourself, your staff and your bottom-line, then you need to read this book." Need tools that will help distance yourself from your competition forever? How about coming up with a compelling tactical plan to maximize revenues? If your answer is "yes", contact Don Farrell today and set up a one-to-one chat to explore service deliverables tailored to your needs! ... Be sure to mention -- Referred by Annie Armen for that special, extra attention! Did you find this article helpful for your business? Please post your comments below... we look forward to reading your feedback. 4. Are You Leaving Your AUTHENTIC Mark? 8. Are you Working With a Resistant Employee?